The New Jersey Geological Survey recently discovered stromatolites providing the earliest indications of ancient biological activity in what would one day become New Jersey. Stromatolites were discovered in the 1.2 billion-year-old Franklin Marble from the New Jersey Highlands. Stromatolites are the fossilized remains of colonies of cyanobacteria that often have a characteristic dome-shaped laminated structure. The lamination's are thin mats that were constructed by the microorganisms as they trapped fine grains of calcium carbonate on their sticky filaments. A new organic mat was then constructed over the sediment, trapping another layer of sediment and producing the next lamination. The Franklin Marble was formed from limestone deposited in a marine (ocean) environment during the Precambrian Era. Paleogeography: Rodinia, the oldest supercontinent for which we have some record, formed during the middle Proterozoic (~ 1100 million years ago) with North America in the center, South America to the east, and Australia and Antarctica to the west. 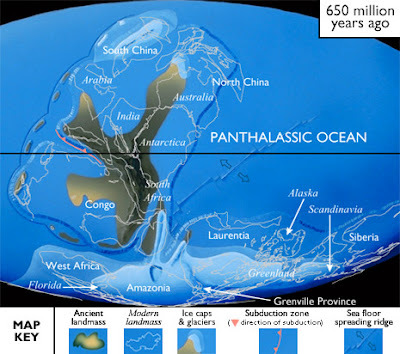 When the Panthalassic Ocean formed about 750 million years ago, Rodinia was split into two parts. One part (North America) moved south, crossing the pole, while the other (Antarctica, Australia, India, Arabia, and parts of China) headed toward the North Pole. 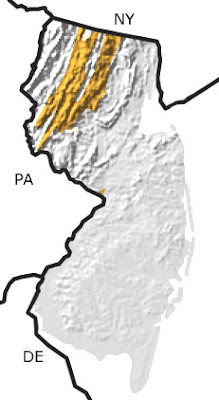 By the end of the Precambrian (~ 600 million years ago), these two parts collided with the newly formed Congo craton (north-central Africa) and formed the supercontinent Pannotia.